The Stephenson County AOK Network and its parent organization, the Stephenson County Health Department, are making great strides to establish a comprehensive, coordinated continuum of developmental screenings and family supports. 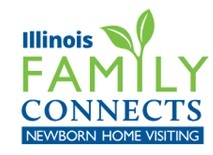 A new link in the continuum is Illinois Family Connects (IFC), a free, universal newborn support program. All new parents, regardless of income, receive information on the free supports. Families are eligible if they live in Stephenson County and if the newborn was born at one of the IFC partner hospitals, FHN Memorial or SSM Health Monroe Clinic. While still at the hospital, nearly all new parents opt into IFC. Three weeks later, a registered nurse visits the newborn and family at least one time (and up to three times). Designed as a compassionate and non-intrusive visit, the nurse does an infant and mother’s health assessment, assisting with breast/ bottle feeding, safe sleep, diapering, and more. When connecting IFC families to community services to meet the family’s unique needs, the AOK Network is indispensable. IFC nurses make “warm referrals” to other service providers, resulting in greater utilization of community services. The collaboration uses SCORE4U, an online “community needs” group that allows service providers to post specific material needs (beds, clothes, etc.) of families and faith and service-based groups can respond. Another exciting expansion of the screening/supports continuum is in the works. Soon there will be a coordinated ASQ (Ages and Stages Questionnaire) screening initiative, using an online hub, for children aged 2-5. Together, these early learning supports work to mitigate barriers for families by meeting families where they are. Stephenson County is keeping its eyes on the prize—ensuring that all families and children have access to the services and supports they need beginning from birth—and demonstrating what is possible through cross-sector partnerships and an active early learning collaboration. Thanks to the Julia Marynus, Director of the Division of Family Services/Stephenson County Health Department; Becky Moore, RN and IFC Team Leader, and Dana Keim, AOK Coordinator for their great work, and for contributing to this article. If you would like to begin a conversation about an IFC program in your community, please email Nick Wechsler or Laurie Roxworthy at the Ounce of Prevention Fund. In many communities in Illinois, immigrants and refugees are an important presence in the community. In these current times, collaborations, social service agencies, and communities may need some additional support to address timely immigration issues. 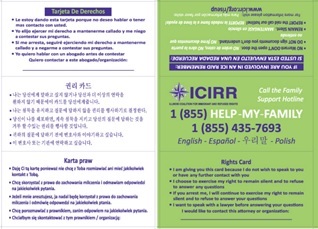 If you’re looking for resources for immigrants and refugees, consider the Illinois Coalition for Immigrant and Refugee Rights (ICIRR). ICIRR is dedicated to promoting the rights of immigrants and refugees to full and equal participation in the civic, cultural, social, and political life of our diverse society. Illinois immigrant legal services directory. Visit https://www.icirr.org/about/get-involved/know-your-rights-and-organize for these and more resources. Register now for the Chicago Engaging Families in Early Childhood Collaborations training! Please save the date for this year’s Partner Plan Act Conference! It is scheduled for June 11, 2019 and will take place in Bloomington, Illinois. This annual conference brings early childhood system stakeholders to learn, network, and deepen their community systems knowledge and skills.! For the first time, the 2019 Partner Plan Act Conference will have a formal Request for Proposal (RFP) process for selecting presenters and content. Presenting at the Partner Plan Act Conference provides an opportunity to build your professional network and learn, reflect, and engage with colleagues. We hope you will consider presenting! Please find details for the RFP here.